Installation of roof systems for military, government, educational, industrial and all commercial markets. Oasis Roofing ensures the highest quality work installing thousands of square feet of quality roofing. 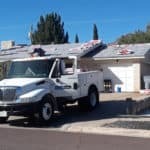 With over 25 years in business, we've become the premier roofing company in the El Paso, Tx area. Oasis Roofing ensures you will receive the highest quality roof system on the market. Oasis Roofing takes the pressure off our customers by providing assistance with insurance and hail damage claims. Selling or buying a home. We help with city permits and inspections reports. Over 25 years of experience in hot tar, built up, fiberglass, elastomeric roof coating, reseal, wind damage, aluminum coatings, blown shingles, leaks, hail damage, roof maintenance, and blown insulation. Free storm and hail damage insurance claim assistance. Oasis Roofing specializes in storm, hail, wind, tree, and water damage repair. 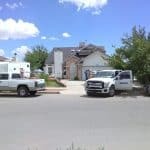 Quality roofing and storm restoration for over 25 years in the El Paso, TX area. We can help you quickly identify which areas of the roof have been damaged. It takes a trained eye to identify bruised matting or loss of the roofs protective layers.